The brachialis muscle: It is the main flexor of your elbow joint. When too tight, it may give you pain at the base of your thumb, in your elbow or at the front of your shoulder. Because it is covered by the biceps brachii, this muscle is unknown to a lot of people. People who frequently overload this muscle include fitness enthusiasts, guitar players or rock climbers. But anyone can experience trouble in this muscle. The brachialis can send pain to the area of your shoulder, upper arm and thumb. 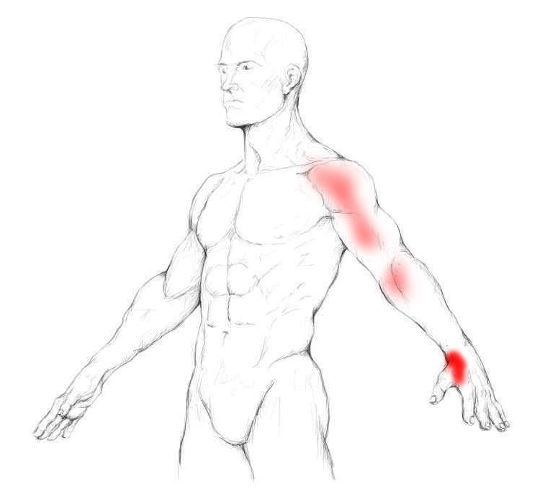 When this muscle is too tight, or has trigger or tender points, it can impair the extension of your elbow. Furthermore, lifting or holding heavy objects with your arm in a flexed position may be painful. Of course, any pulling motion may be impaired or painful too. Fitness exercises – e.g. pull ups, arm curls, chin ups, rowing: Anything involving elbow flexion –. Playing the guitar – especially the strumming arm –. The brachialis attaches at the ulna and at the front of your humerus. This muscle has only one function and it is brilliant at it: Flexing your elbow. The brachialis muscle gets overloaded and develops trigger points mainly by repetitive stress and overuse. That means if you use the muscle too often or too hard, it may punish you. So, when doing arm curls with weights, wielding a heavy chainsaw, or lifting furniture, take frequent rests, especially if you are not used to that kind of work. It is really sustained stress which is problematic: The furniture-moving example being exemplary: You may over-stress the muscle because mostly you carry things with your elbows bent, which activates the muscle permanently. Although this muscle lies under the biceps brachii, it is pretty accessible as the biceps can be pushed to the side quite easily. Put your thumb in your elbow crease and move it a couple of times sideways. You should feel a muscle jumping under your thumb. Travel a little upwards your arm to feel where the muscle runs. That muscle is your brachialis. For massage, I recommend using the thumb technique. First push your biceps to the side – as explained above – and then search for tender and trigger points in the muscle. 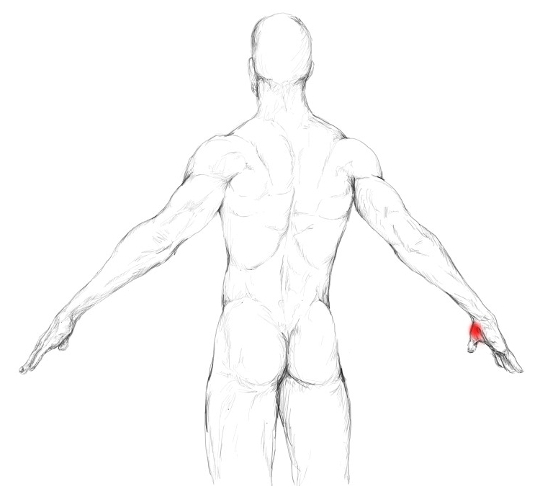 For navigation of the most common tender spots you can use the muscle picture which is shown above. Xs indicate where those points usually appear. As soon as you find a trigger or tender point, massage it a couple of times with deep and repeated strokes. Pay attention not to slide off the muscle as in its vicinity there is a nerve running. It will not result in a permanent damage, but if you pressure the nerve too much, it may give you pain for as long as a week. So be cautious and do not force things.